Lt. Tony Turner (Clark) is a highly respected member of the elite team known as the Delta Force. While stationed on a military base in Puerto Rico, evil Sandinistas (?) break into the base and steal a nuclear bomb. During their raid, they maliciously kill Turner’s pregnant wife. BIG MISTAKE. Crazy with revenge, Turner begins tracking their every move (and killing everyone in sight), and along the way he ends up dragging ace pilot Capt. Samuel Beck (Williamson) along for the ride. While they don’t always get along (the main theme of the soundtrack sounds like a disco version of the theme from “The Odd Couple” - coincidence? ), they must fight for their lives as they face a barrage of attacks from their enemies. Once they make it to the hideout of the baddies in Nicaragua, Col. Keitel (Svenson) injects himself into the final outcome. What will happen to Turner and Beck? Here we have some Italian-made silliness that’s enjoyable to watch mainly because of Fred Williamson, the endless violence (which is more amusing and cartoon-like than dark) and the funny dubbing. It has enough standout moments to keep the viewer interested. Sure, the editing is choppy and abrupt a lot of the time, but that just adds to the charm and uniqueness. Every movie you see in the theater nowadays is perfectly edited, and it’s just plain boring! 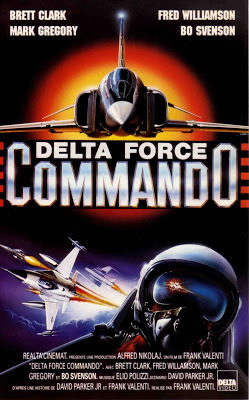 Don’t be afraid to let the magic of Delta Force Commando sweep over you. Don’t fight it. Just enjoy it. Amidst the constant mindless shooting and rocket launcher blow-ups, we should point out that it’s said that as a pilot, Beck is “The Best”, and, of all the possible names they could have chosen as his handle, it’s “Black Eagle”. Nothing racist there. But why should Sam “Black Eagle” Beck be annoyed that Turner is following his every move like a puppy dog, when, despite the never-ending supply of machine guns, Turner breaks out the most effective weapon in war: a slingshot! It’s nice to know that in the thick of combat, Dennis The Menace could triumph in a firefight. Like any video game worth its salt in the 80’s, there’s an inexhaustible supply of enemy soldiers to dispatch who all wear the same clothes (and in this case, all have Nazi-like black helmets). During the Prerequisite Torture Scene, Beck’s interrogator wants to know if he’s “working for the Contras”. Not only was this very topical, but it will put you in mind of a certain video game with a constant stream of baddies you must kill with your machine gun: Contra! But unlike Contra, Delta Force Commando has extremely inane dialogue, stock footage, and our personal favorite, REPEATED footage. But you could never accuse this movie of skimping on the action. There’s actually some filler, and the movie starts to lose focus after a time - but it’s going to take a WHOLE ARMY to stop our two heroes. Including tanks! Mark Gregory (who’s had an amazing career in the Italian film industry, most notably with some of the post-apocalyptic movies) is the main baddie with the ill-fitting, ridiculous women’s shirt. 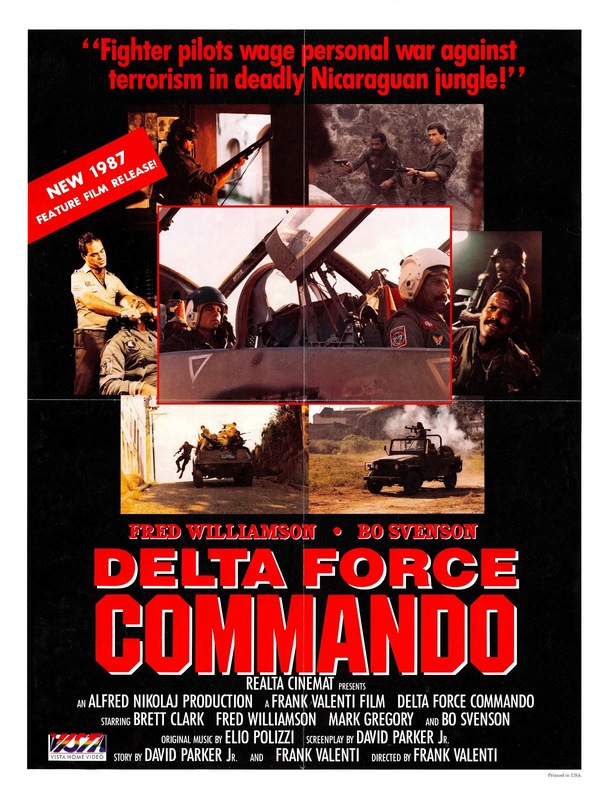 Naturally, unanswered questions about this led to a sequel, the long and confusing title of: Delta Force Commando 2: Priority Red One (1990). Nothing else could possibly explain why there’s a SEQUEL to this movie. Was this financially successful? But in the sequel, which was also directed by Ciriaci, Bo Svenson and Brett Clark did not return. Who would be the best replacement for Brett Clark? Van Johnson, naturally. And instead of Svenson (who wears the same kimono here that he does in The Kill Reflex, 1989), Ciriaci got Richard Hatch (booooo.) Fred returned, of course. 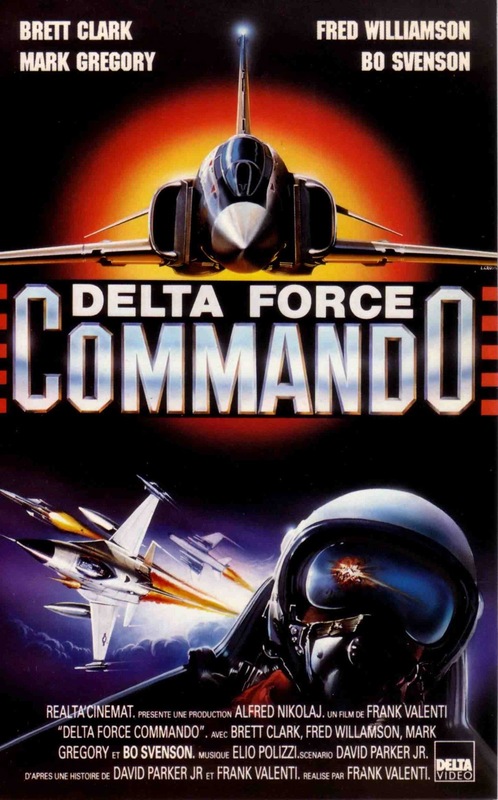 As long as you don’t take it too seriously, you’ll probably get a kick out of Delta Force Commando.